No other jam band can cause quite a stir like Widespread Panic. They do have a noteworthy reputation for unpredictable improvisations, luscious guitar licks and jam sessions that seem to go on forever in their live shows. But no one is complaining. Fans love every bit of it that they don't mind standing, swaying, dancing and jumping on their feet from start to finish. Joining Widespread Panic onstage are fellow jammers Jerry Joseph and The Jackmormons. Don't miss this experiencing the feel-good vibe of this gig. Go, get yourself a ticket now! Widespread Panic's current band line-up include: The guitarist/singer John Bell, bassist Dave Schools, drummer Duane Trucks, percussionist Domingo "Sunny" Ortiz, keyboardist John "JoJo" Hermann, and guitarist Jimmy Herring. Michael Houser and George McConnell have also played lead guitar for the band. Their live performances always get the thumbs-up and multiple stars from music critics. In fact, they hold the 2013 record for most number of sold-out performances at different venues around the country. Their tenacious and cohesive sound, their eye-popping light shows, and great chemistry has secured their foothold of guaranteed-sold-out shows in the live touring circuit. 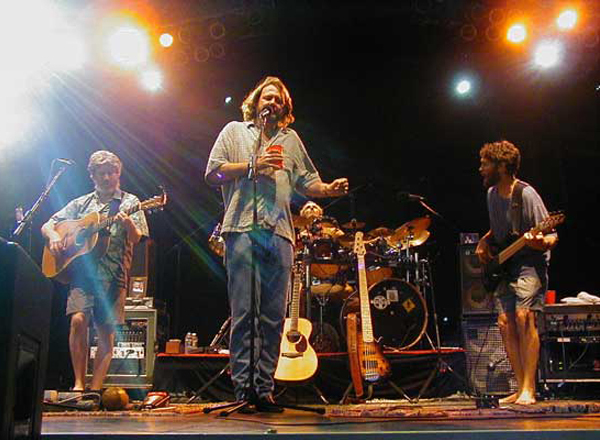 Widespread Panic is indeed a formidable act with a growing following and an influential streak in the genre of Southern rock, Blues rock, jazz fusion, jam rock, and neo-psychedelia.